Draft: 2015, San Diego Padres, 3rd rd. Jacob James Nix…attended IMG Academy (FL)…competed on the US National Baseball Team that won the gold medal in the 2013 18U Baseball World Cup…participated in the 2014 Perfect Game and was a 2nd Team All-American as well as an All Region 1st Team selection...named to the 2013 Underclass 3rd Team by Perfect Game. Split the season between San Antonio (AA), El Paso (AAA) and SD, making nine starts for the big-league club...Between SA and ELP, went 3-3 with a 1.84 ERA (12 ER, 58.2 IP) in 10 starts with a .215 opponent clip...Allowed three earned runs-or-fewer in all nine of his Double-A outings, including two earned runs-or-fewer in seven outings and one-or-fewer in six...Ranked second in the Texas League in ERA (2.05) and fifth in opponent average (.211), minimum nine starts...Promoted to ELP on 8/4, tossing 6.0-shutout IP of five-hit ball vs. Round Rock, striking out three and walking none...the only time his ERA sat above 2.00 was prior to his final Double-A start, when it was 2.05...In his ML debut on 8/10 vs. PHI, worked 6.0 innings of four-hit, scoreless ball, accruing four SO on two BB and leading SD to a 2-0 victory over PHI...became the 13th Padre to make his ML Debut in '18 and the fifth to do so as a starter...was the first Padre to toss 6.0-or-more scoreless innings in his debut since Odrisamer Despaigne on 6/23/14 at SF (7.0 innings)...In his fourth-career ML start on 8/28 vs. SEA, pitched 8.1 innings of eight-hit ball, allowing just one run (earned) with no SO and no BB...became the second SD pitcher in club history to work 8.1-or-more innings and not fan a single batter or allow a walk (first: Randy Jones on 5/30/76 when he worked 10.0 innings in a complete game win vs. SF)...Among all NL rookies who made at least nine starts, his 3.83 run support average was the fourth-lowest and his 13 overall runs of support were the fewest...Both of his ML victories came at Petco Park, where he had a 5.23 ERA (18 ER, 31.0 IP)...in three games on the road, he went 0-2 with a 11.91 ERA (15 ER, 11.1 IP)...Relied on five pitches: four-seamer (62.3%), curve (20.4%), changeup (14%), slider (3%) and cutter (0.2%)...his 25.0 strikeout percentage on his slider was his highest of any of his pitches...Entered 2019 rated as the Padres No. 14 prospect by Baseball America and No. 21 by ESPN.com. Split the season between Lake Elsinore (A) and San Antonio (AA), pitching to a combined 5-5 record over 17 games (16 starts) with a 4.67 ERA (49 ER, 94.1 IP) and 73 SO against 19 BB...promoted to El Paso (AAA) for to start Game 4 of the Pacific Coast League championship series...Began the year on the seven-day disabled list before being activated on 5/26 with Lake Elsinore...Earned California League Pitcher of the Week honors for the week ending in 7/2 after throwing a complete game shutout, allowing just two hits while striking out 11 vs. Rancho Cucamonga...his 9.0 IP and 11 strikeouts on 7/2 were both single-game career highs...Was one of only two Cal League pitchers to record a complete game shutout during the season...Promoted to San Antonio on 8/3 and made six starts for the Missions, going 1-2 with a 5.53 ERA (49 ER, 94.1 IP)...Made his first career postseason start and tossed 7.0 IP of three-run ball (two earned) in the Missions' 4-1 loss in Game 5 of the Texas League semifinals...Promoted to El Paso on 9/16 and started Game 4 of the PCL championship that same day, earning the win to force a Game 5 behind 6.2 IP of one-run ball om El Paso's 5-1 victory...In his two postseason starts for San Antonio and El Paso, went a combined 1-1 with a 1.98 ERA (3 ER, 13.2 IP) with six SO and one BB while limiting hitters to a .208 average...Ranked by MLB.com as the No. 7 prospect in the Padres organization following the season...Entered 2018 rated as the No. 14 prospect in the Padres organization by MLB.com. Spent the entire campaign with Fort Wayne, earning a spot on the Midwest League Mid-Season All-Star roster...Recorded career highs in games started (25), innings pitched (105.1) and strikeouts (90)...Ranked by Baseball America as the No. 7 prospect in the Padres organization following the season. Made his professional debut with the AZL Padres (R), going 0-2 with a 5.49 ERA (12 ER, 19.2 IP) in seven appearances (three starts)...Ranked as the No. 8 prospect in the Arizona League...Rated by Baseball America as the No. 11 prospect in the Padres organization after the season. April 2, 2019 San Diego Padres transferred RHP Jacob Nix from the 10-day injured list to the 60-day injured list retroactive to April 1, 2019. Elbow strain. 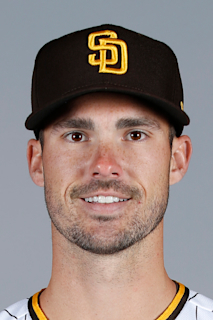 March 27, 2019 San Diego Padres placed RHP Jacob Nix on the 10-day injured list. Elbow strain. August 10, 2018 San Diego Padres selected the contract of RHP Jacob Nix from El Paso Chihuahuas. August 2, 2018 RHP Jacob Nix assigned to El Paso Chihuahuas from San Antonio Missions. July 11, 2018 San Antonio Missions activated RHP Jacob Nix from the 7-day disabled list. June 29, 2018 San Antonio Missions placed RHP Jacob Nix on the 7-day disabled list retroactive to June 27, 2018. May 30, 2018 San Antonio Missions activated RHP Jacob Nix from the 7-day disabled list. April 5, 2018 RHP Jacob Nix assigned to San Antonio Missions from El Paso Chihuahuas. January 18, 2018 San Diego Padres invited non-roster RHP Jacob Nix to spring training. September 16, 2017 RHP Jacob Nix assigned to El Paso Chihuahuas from San Antonio Missions. August 3, 2017 RHP Jacob Nix assigned to San Antonio Missions from Lake Elsinore Storm. May 26, 2017 Lake Elsinore Storm activated RHP Jacob Nix from the 7-day disabled list. April 2, 2016 RHP Jacob Nix assigned to Fort Wayne TinCaps from AZL Padres. June 20, 2015 RHP Jacob Nix assigned to AZL Padres. June 19, 2015 San Diego Padres signed RHP Jacob Nix.